Download now to enjoy learning how to make a memory book from a basic flag or tag book design! The flag or tag book is a visually complex style of book with ‘flags’ or tags of paper or card adhered to an accordion spine. When closed, you can leaf through it like any other book, but when fanned open, it puts on a fabulous display of pages. When constructed with two or three layers of flags, the flags cross over each other as they open, creating a visually exciting display. This flag book form makes a perfect memory book. The fanned pages and roomy binding lend themselves really well to the display of holiday and vacation memorabilia. Dea has made many different book forms over the years, and returns to this deceptively simple form over and over again for special displays. 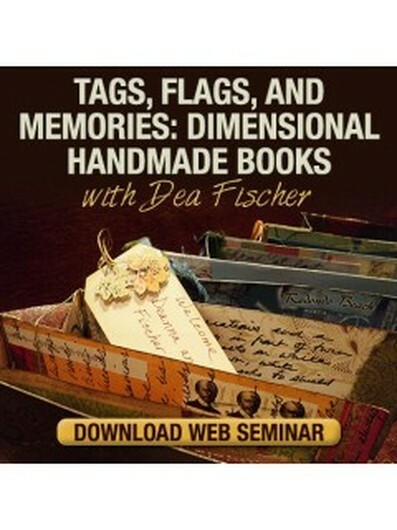 In this seminar, Dea will lead you step by step through construction of a flag book and build it into a real memory book for that special vacation or holiday.